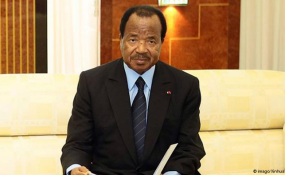 Cameroon - Can Elections Be Held in the Restive Anglophone Regions? Armed separatists in the Anglophone northwest and neigboring southwest regions have vowed they will not allow a "foreign election." Paul Biya, Cameroon's president since 1982, is seeking re-election. Vying to oust the 85-year-old leader are eight candidates representing a string of opposition parties. The election campaigning starts nationwide on Saturday. The incumbent himself is not expected to show up in the Anglophone regions, where only one candidate has ventured in the run-up to the vote and the escalating conflict has prompted an exodus of people - including voters. Nearly 400 people have been reported killed since long-running tensions turned violent in October 2017 and separatists declared self-rule in the region they call Ambazonia. At the Mile 17 Motor Park in Buea, region's capital, the governor of the region, Bernard Okalia Bilai, is pleading with hundreds of commuters to go back to their homes. "There is fake news that the army will launch an attack. No, the army is not launching attacks. The army is there to protect the population and their property and the army is there to neutralize those attacks," Bilai says. "Those who are abandoning their homes, you can see here, the luggage, we have beds, furniture. No, where are they going? No, we want them to stay at home." Bilai has been visiting the park almost daily to try and stop the exodus of residents from the worst-affected regions. Teacher John Nlom, who is leaving with his wife and five children, says he does not trust the governor's assurances that their security is guaranteed. "The governor himself, who is saying that people should stay back, that they are protected, is moving around with soldiers protecting him. Will the soldiers protect all the people? That is the reason I cannot stay. I have to leave," Nlom says. Over the past three weeks, thousands of residents have packed up and left, according to authorities. They don't care much about voting in an election that won't be free and fair, says Prince Ekosso, president of the United Socialist Democratic Party (USDP). "It is impossible for credible elections to take place in the northwest and the southwest. As a matter of fact, the towns and cities of the northwest and the southwest have been deserted," Ekosso says. "It's already late now for anything to be done for free and fair elections to take place in the two regions." Presidential candidates across the country have been encouraging voters to cast their ballots on October 7. Prophet Frank Ndifor Afanui, a candidate for the opposition Cameroon National Citizenship Movement, is the only one to travel to the southwest region so far, with a visit to Mutengene. "They will not win the war, so why continue fighting that war? Is it a solution for a country in crisis just to split into two parts just because we have may be a government which is not listening to them? Go and vote because it is the only solution. We do not have to sacrifice our people," Kamto says. Social Democratic Front (SDF) candidate Joshua Osih says he sees a solution to the conflict. "The problem is not the secession. The problem is the marginalization and injustices that lead to that secession. The secession will not necessarily solve that problem," says Osih. "When you have a president of the republic who understands these issues, the first thing that has to happen is to solve the problem of marginalization. I have absolutely no problem that as soon as I am elected, one of the first decisions I take is to recognize that it is a political problem." Cameroon's election commission, ELECAM, has been meeting with political parties to find out what can be done for elections to take place peacefully in the sub-regions. Its board chair, Enow Abrams Egbe, says that although voters are leaving the areas, the commission will ensure an election is held for those who remain. "In terms of security measures, after much discussion with our partners on the ground, we felt that it was necessary to regroup the polling stations into polling centers and a lot of considerations were taken," Egbe says. "There are two levels of distribution of material. The first material we call light electoral materials, I can say almost 100 percent are already on the ground. The heavy material concerning ballot papers and campaign materials are already on the way." Many Cameroonians believe the election is merely a charade to rubberstamp the Biya's stay in power. The government in Yaounde says more than 100 countries and institutions have applied to send election observers, but it is not known which have been accredited. The European Union will not deploy observers to Cameroon for the election, as it has with all polls since the country adopted a multi-party system in 1990. "Election observation has not been scheduled or prepared. But of course we are watching what happens," says Hans-Peter Schadek, the head of the EU delegation in Cameroon. The 28-member bloc, Schadek says, is working with civil society in Cameroon - and in particular, a non-governmental initiative to promote more participation of women in politics. Emile Bindzi, a spokesman for Universe party candidate Cabral Libii says the EU's failure to send election observers "raises a lot of questions in Cameroonian society." There are some who believe that the EU would like to leave Cameroonians to their sad fate. Henri Fotso contributed to this report.